Video: At TED2013, Former Michigan Gov. Jennifer Granholm Proposes Clean Energy Jobs "Race to the Top"
Former Michigan Gov. Jennifer Granholm kicks off the TED2013 conference with "a very American question with worldwide implications: How do we make more jobs?" 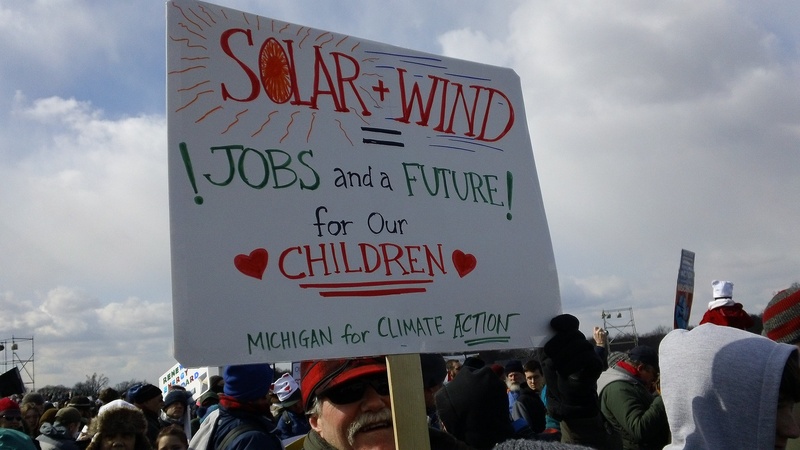 The answer: by "empowering states to create jobs through a Clean Energy Jobs Race to the Top." 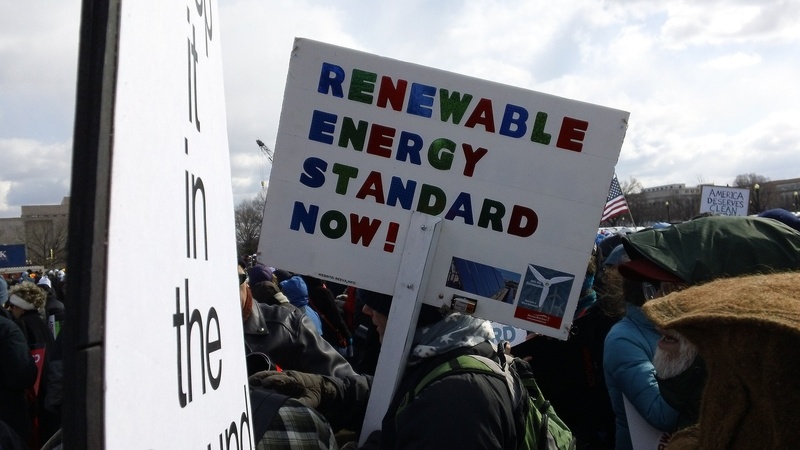 “Why is it important to pass policies that support Renewable Energy Technologies?" Should the Oil and Gas Industry Be Allowed to Intentionally Contaminate Drinking Water Supplies? We Don't Think So. According to this story, even Wyoming's state government, which frequently acts like a wholly-owned subsidiary of extractive industries, doesn't think it's a good idea to intentionally contaminate drinking water supplies. The Billings Gazette reports, "The Wyoming Department of Environmental Quality in a Feb. 11 letter opposed a plan by Encana Oil and Gas to pump water from its oil and gas wells deep into the Madison geological formation." What's the message here? That Wyoming only wants contamination of aquifers to happen accidentally, not intentionally? It's puzzling, but at least Wyoming's not totally abdicating all responsibility to safeguard public health. Despite relentless advertising by the fossil fuel industry aimed at winning the public's support, we've seen poll after poll showing that the American people consistently, and strongly, prefer a clean energy future. Well, we can add yet another one to that list. The Guardian: "Dirty fossil fuel exports will come back to bite Australia"
It seems to us that the argument made in this post by Graham Readfearn in The Guardian could be made for any number of fossil fuel exporting nations - including our own. We wanted to highlight this story, as it's yet more evidence that clean energy is not just the wave of the future, but the wave of the present. Could Improved Building Energy Efficiency Help NY City Slash Emissions 90% at Low Cost? In case you missed it, this article by Will Oremus is well worth reading. Referencing a new report by the Urban Green Council, Oremus describes a simple, elegant way for cities like New York to "slash...its [greenhouse gas] emissions by a whopping 90 percent by 2050 without any radical new technologies, without cutting back on creature comforts, and maybe even without breaking its budget." How is this possible, Oremus asks? At MediaMatters, a former CNN producer provides strong evidence that anti-clean energy, pro-fossil-fuel Fox News exerts an a deleterious gravitational pull on other parts of the media world. Video: Billionaire Investor Tom Steyer Says We Need a "cleaner, safer, cheaper energy future"
Here are a few photos (please click to enlarge) from today's "Forward on Climate," anti-Keystone Tar Sands Pipeline rally near the Washington Monument. A major theme of the rally was the need to move as quickly as possible away from polluting forms of energy, such as tar sands, and towards wind, solar, and other forms of clean energy. Despite the cold, there were upwards of 35,000 people from all over the country, and speakers such as 350.org President Bill McKibben (see his account of the event here), Tom Steyer (Investor and founder of the Center for the Next Generation), Chief Jacqueline Thomas (Immediate past Chief of the Saik’uz First Nation in British Columbia and co-founder Yinka Dene Alliance), and Maria T. Cardona (Latinovations Founder, Dewey Square Group Principal). Also see the Forward on Climate press release, and click here for more photos from the event. Video: ACORE President Dennis McGinn Says Opposition to Clean Energy by Fossil Fuel Companies is a "sign of our strength"
Before we get to our critique, let's just note that we like the premise of David Brook's latest NY Times op-ed, "Carpe Diem Nation." In this video from the ACORE policy forum held in Washington, DC last Wednesday (see here for a summary of the event), Interior Secretary Ken Salazar stresses the importance of pushing ahead aggressively on clean energy, so that we’re not hostage to foreign oil or the realities of climate change. Salazar points to the enormous potential of both onshore and offshore renewable energy in the United States, as well as great progress made the past four years, and stressed the need to upgrade our country’s transmission grid, because it’s “stranded energy” unless we can get that wind and solar power from where it’s produced to where it’s demanded. Salazar stressed the importance for the clean energy industry of turning “skeptics” into “believers” by showing the success of actual projects “on the ground.” Finally, Salazar argues that a stable policy environment is crucial to realizing clean energy’s full potential as rapidly as possible. Report: "High-speed rail modernization is good for manufacturing jobs, good for economic growth and good for the environment"
Looking for yet another example of how moving towards a cleaner, advanced technology economy is a winner economically for the United States? Here it is, this time in the transportation sector. An opinion piece by the chief economist of BP, Christof Ruhl, caught our eye, for its sheer chutzpah if nothing else. According to Mr. Ruhl, it turns out that "North America’s oil and gas renaissance, which has the potential to fuel a U.S. industrial recovery with cheaper energy, is not a happy accident of geology and lucky drilling." Instead, Ruhl asserts, this "renaissance" occurred because of "open access, sound government policy, stable property rights and the incentive offered by market pricing unleashed the skills of good engineers." Is the "Saudi America" Meme Yet Another Piece of Fossil Fuel-Funded Propaganda? A popular meme that's been going around the past few months argues that the United States is "Saudi America", with a new found abundance of fossil fuels, leading to the United States "becom[ing] the world’s largest oil producer by 2020, outstripping Saudi Arabia and Russia." The problems with this meme are laid out in a new article at Slate by Raymond T. Pierrehumbert, Professor in Geophysical Sciences at the University of Chicago, "a lead author of the IPCC Third Assessment Report and is a fellow of the American Geophysical Union." It's getting to be a tired old story, but Fox News yet again has misreported and distorted the facts about clean energy. According to a recent TechCrunch story, "when untruthful information is immediately corrected in a news story," it doesn't fix the effect. In fact, a new study concludes, calling out false information can paradoxically make users “more resistant to factual information." Or, as the TechCrunch article puts it: "The more truth we read, the more we tend to believe strongly held lies." What should the penalty be for doing this? I had the pleasure yesterday of attending the National Renewable Energy Forum, sponsored by the American Council On Renewable Energy (ACORE), in the Cannon House Office Building in Washington, DC. I "live tweeted" the event at the Scaling Green Twitter feed, and also recommend that you take a look at the Twitter feeds of Greentechmedia reporter Stephen Lacey, Clean Tech Nation author Clint Wilder, and ACORE Vice President Tom Weirich. Finally, I recommend Stephen Lacey's report on how conservative Congressman Steve King strongly supports federal assistance to renewable energy. 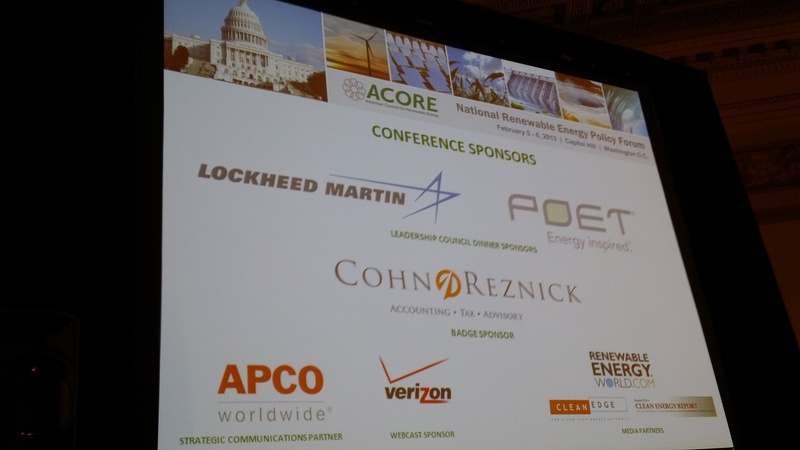 I spent the morning at the American Council on Renewable Energy (ACORE) 2013 policy forum, listening to a series of speakers express generally optimistic views about the future of clean energy. On cloud hanging over clean energy's future, noted by several speakers, is a dysfunctional national energy policy, in which fossil fuels continue to be heavily subsidized, while clean energy is wildly under-subsidized. In short, despite claims by fossil fuel interests to the contrary, we not only aren't operating on a "level playing field," but in fact that field continues to be heavily tilted towards oil, gas and coal. What's so impressive is that, despite this clear policy bias, clean energy continues to make rapid gains. For instance, this story caught our eyes. Liebreich: "The smoke is clearing from the energy sector’s equivalent of the Battle of Borodino"
Recently, we heard Bloomberg New Energy Finance CEO Michael Liebreich deliver a fascinating "TED-style" talk at the U.S. Department of Energy's "Energy All-Stars" event. At that event, Liebreich argued that the difficulties of the past few years in cleantech are resolving themselves, that the underlying economics of renewable energy are strong, and that in coming years "we're going to win." Pennsylvania Being "Transparent" Enough on Water Contamination from Oil and Gas Operations? According to this story by the New York Times, about the Pennsylvania Department of Environmental Protection's "cancellation of a meeting on the state’s testing of water from water wells near natural-gas drilling sites," the state appears to be more concerned with protecting the polluters than the people of Pennsylvania.